This is the signature run in Marseille. Run along the Corniche Président John Fitzgerald Kennedy, from Pharo Cove near the Marseille Old Fort to the Prado Beach (Plage). There are fantastic views of the Mediterranean on the road, which at times rises to 50 meters. The route enjoys the beaches of the Catalans, Malmousque, the beach of the Prophets with views to the hills of Marseilleveyre and the islands of Friou. The distance is 5.3 km (3.3 miles) one-way, with some elevation gain. There is a path alongside the road, which is enjoyed by cyclists, walkers, and runners. 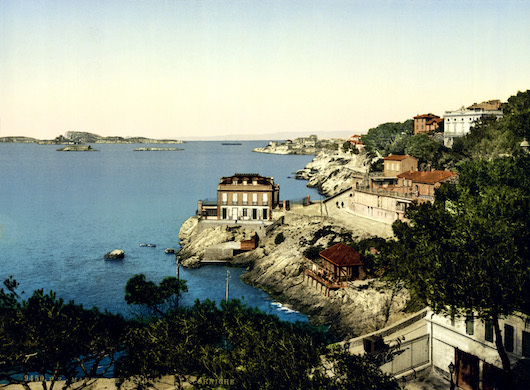 Frequent buses run between Prado Beach and Marseille, so it’s possible to do a one-way run and take the bus back. Add-On: Parc Borély is 500m to the east. Château estate, now a public park with 18th-century formal gardens & fountains, and a lakeside cafe, has some lovely trails, and a pedestrian path along the Huveaune River.